With exams, I haven't had much time to read. In the past month, I've only finished one book, which is why there haven't been that many reviews lately. That one book was Ava Dellaira's debut and, with there being a review from the author of 'The Perks of Being a Wallflower' on the front, I had high expectations. It begins as an assignment for English class; write a letter to a dead person. Laurel chooses Kurt Cobain - he died young, and so did Laurel's sister May - so maybe he'll understand what Laurel is going through. Soon, Laurel is writing letters to lots of dead people - Janis Joplin, Heath Ledger, River Phoenix, Amelia Earhart, Amy Winehouse...It's like she can't stop. She writes about her new high school, her new friends, her first love - and her shattered life. But, the ghosts of Laurel's past can't be contained between the lines of a page forever. She must face up to them - before they consume her. 'Love Letters to the Dead' is an unflinching novel about grief, guilt and growing up, all told in the format of letters to those we have already lost. Ava Dellaira's debut novel has an idea I continue to feel envious of, with her writing filled with the brutality we come to accept in this world. Laurel's voice was full of anger and, full of her frustration. However, I still found myself feeling disappointed. It fell into the traps that its predecessors have found themselves stuck in before: trying to be the next John Green or Stephen Chbosky. Dellaira's voice is one we need on the literary scene: untamed, unapologetic and unsuspecting. But, her debut just became mediocre. I can't write this review praising the idea, or applauding her ability to handle a tough-topic - which are great - when I know that this could have been better. Thank you to Hot Key Books for providing me with a free copy of this novel in exchange for an honest review. For older readers - 3 stars. 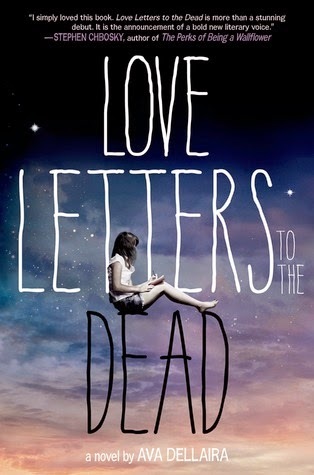 Have you read 'Love Letters to the Dead'? If not, will you be picking up this book? I read this as soon as it was published as I couldn't wait to read it and personally, Love Letters to the Dead didn't fail to let me down. I gave it a 5 star rating which I'm still thinking over as whilst parts were confusing, I liked the way that that came into this novel.